Mix the ground ingredients and the meat together and grind to a slightly grainy consistency, slightly finer than the finely minced meat. Mix in the yogurt and the 1 tsp ghee and shape into desired size balls. Heat the ghee in a heavy based frying pan and add the koftas into it. 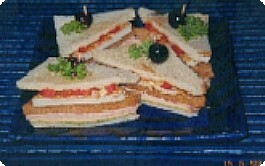 Cover and cook for about 3 minutes. Uncover, and turn the koftas which should be brown on the underside by now. Sprinkle the shredded ginger over, and let cook till cooked through. 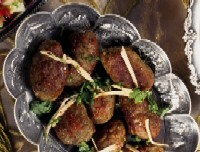 Transfer the koftas on to a serving dish; sprinkle the chilli powder and the coriander leaves and serve.